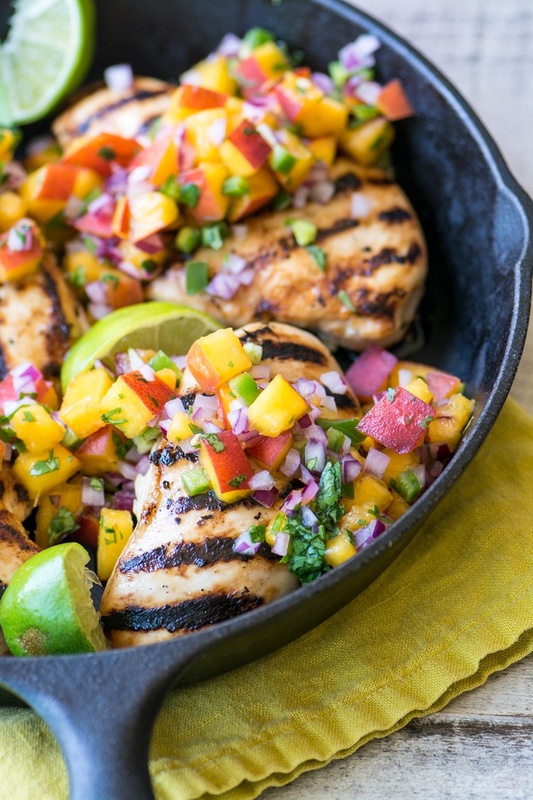 Grilled Chicken with Peach Jalapeno Salsa ~ this lightning quick meal is low calorie, low fat, low carb, gluten free, and also insanely delicious! Pound the chicken breasts between two sheets of plastic wrap so they are a little thinner, maybe about 1/2 inch. Put the chicken in a shallow container, or into a gallon sized zip lock bag. Whisk the marinade together and add it to the chicken. Massage it into the meat, seal the container or bag, and set in the refrigerator for an hour or overnight. For the salsa, cut the peaches into a small dice...no need to peel them. Add to a bowl. Mince the red onion and the jalapeño pepper. Leave the seeds in for extra heat, or leave them out if you like. Add the cilantro and lime juice and toss. Refrigerate until needed. Grill the chicken on a hot charcoal grill or on the stove top, about 5-7 minutes per side, or until done in the center ~ an instant read thermometer should read 165 when inserted into the thickest part. Serve the chicken with the salsa on top. Garnish with lime wedges.